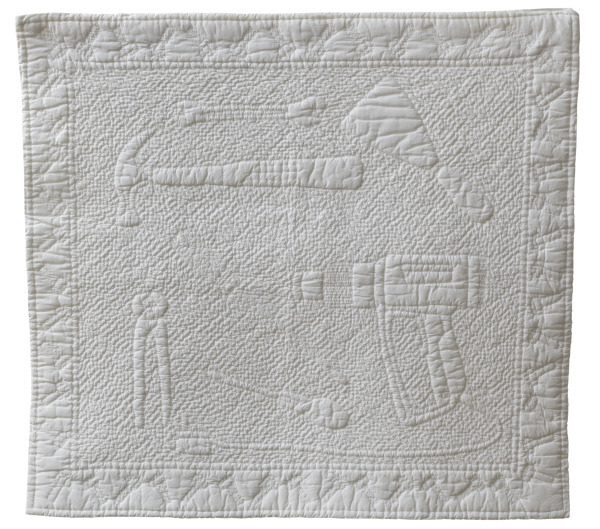 Quilted white cotton fabric and thread, depicting a drill, plyers, screwdrivers, a wrench and a scraper. Cotton thread on cotton cambric with polyester wadding and pillow cotton backing. The piece is hand quilted using running stitch. No equipment other than a needle was used in its construction. 1993: This piece was completed shortly after "Whitework quilt", a large hanging. Both pieces came about as a direct result of decorating my flat and all the tools involved in the process. In this piece (as opposed to "Whitework quilt") I used a finer cotton with more dense stitching - to raise the objects depicted into more relief.